Over 170 three-member teams entered the competition by competing in one of fourteen regional competitions. Like all regions throughout the U.S., Wake Forest Law’s region, which is the nation’s largest, permits the top two teams to advance to the national finals. During the national tournament’s preliminary rounds, Wake Forest defeated Georgetown and narrowly lost to the defending-champion, Northwestern, who would go on to place second overall. The Demon Deacons nevertheless advanced to the Sweet Sixteen round of the competition by virtue of their overall score in the first two rounds, but would later narrowly fall to Cornell. In addition to ending the season among the nation’s most seasoned competitors, Wake Forest’s brief earned recognition, having been recognized as the 7th best score out the top 28 teams in the country. Each team member earned high praise from the judges and their opponents. 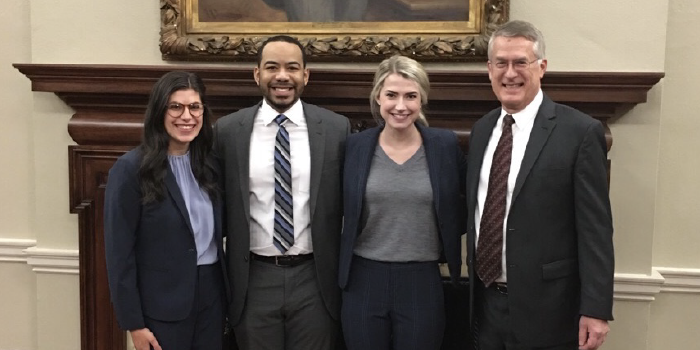 The National Moot Court Competition, which is in its 69th year, is sponsored by the New York City Bar and the American College of Trial Lawyers. Wake Forest Law most recently won the national championship in 2017.